I'm just trying to make myself feel better, okay?! There are a couple ways to look at this game, this team, and the direction things are going. I'm an optimist by default, especially when it comes to Michigan football. I see a program that handled at worst a decent Florida team, and has spent the last couple games trying new things, seeing what works, what doesn't, and who will be stepping up once the schedule toughens in Big Ten play. I don't see an offense that is "broken", like many pundits proclaimed during the game yesterday. I see an offense with a lot of new faces in key positions...like the right side of the OL, receivers, tight ends...spots where it takes time for guys to acclimate to the college game. Thankfully, Michigan has the talent to be able to pull away from teams like Cincinnati and Air Force, while using what I think is a fraction of the playbook, and getting young kids ready for a much tougher schedule to come. I saw a brand new field goal kicker nail 5 kicks, with a long of 49, tying an all-time single-game Michigan record. I saw a kicker send kickoff after kickoff through the endzone. I saw a young punter beginning his career looking solid, hitting a 45 yarder and also pinning one inside the 20. And of course I saw a star in the making in freshman Donovan Peoples-Jones when he returned a punt 79 yards to the house. I saw a defense...a defense that has all of the pieces, right now, to be one of the greatest defenses in Michigan football history. Do not make the mistake of minimizing the threat of Air Force's triple option. In terms of rarity, it would be like visiting a city where cars drive on the wrong side of the road and being expected to navigate rush hour. The flexbone is a very rare offense in football. Michigan held a potent offensive attack to 13 points, 232 total yards...64 of which came on Air Force's one and only reception, which was also their only touchdown. This, just a week after putting up 62 points and 663 yards of offense (473 on the ground) against VMI in their opening game. I don't have any great insight into what the offense is doing and why they're not exploding the scoreboard against, what we all assume, are much lesser opponents. Michigan is moving the ball well at times, not so well other times, but they're putting up yards and stats that aren't seemingly worrisome. But the redzone struggles are real. It hasn't hurt Michigan yet, but settling for 3 points isn't going to cut it soon. And turnovers are still a hinderance. Speight might be the problem. His young targets might be the problem. The playcalling might be the problem. 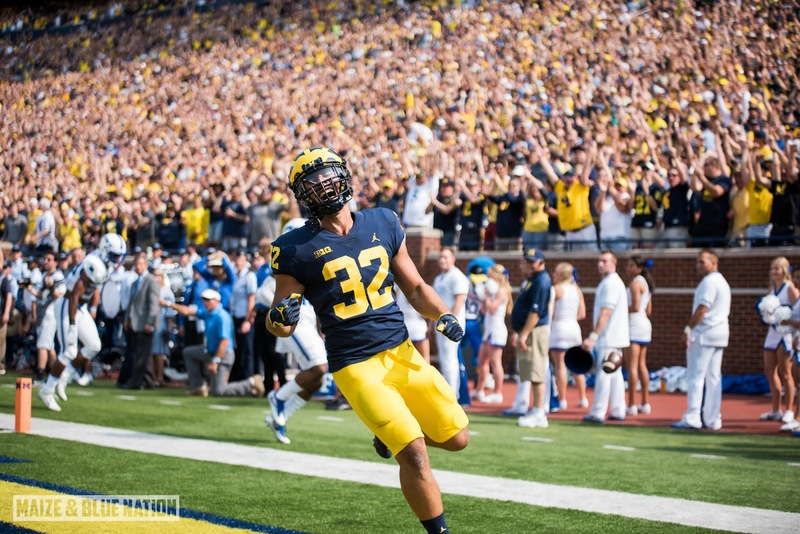 All of those things have been and will continue to be scrutinized as Michigan now heads onto the road to take on an upstart Purdue squad that will be more than ready to host a top-ranked Michigan for their homecoming. Like I said, field goal kicking highlights an overall nice game by the special teams. In a game lik this, that was the standout for me. Offensive flow continues to be a concern. Turnovers, even if it's just a pooprly timed fumble really seem to effect this offense in terms of stopping all momentum. Play calling is odd as well. In games like this against lesser opponents , I get that you're just trying new things, but still a concern. Multiple nomininees this week for the defensive award, but Winovich gets the nod for his overall playmaking ability and just wreaking havoc all over the field on Saturday. Once again, Brown had his unit ready for AF's unique attack and passed with flying colors, allowing only one touchdown on the one and only pass completion of the day. Everything else for AF was a few small gains here and there, but nothing like what we saw when AF visited last time.